Jonathan Corona came to Auburn for many of the reasons undergraduate students typically do — the beautiful campus, the close-knit Auburn Family atmosphere, and an education from a top public institution. 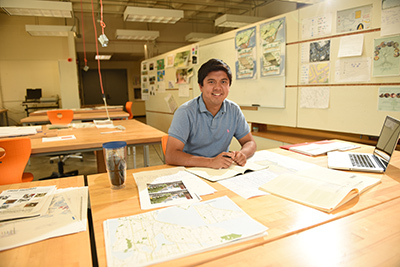 Now a senior majoring in environmental design, Corona once dreamed of graduating from Auburn and then earning his master’s degree in urban planning from the University of Michigan before embarking on his career. But now he’s found an even better, more cost-effective way of achieving his dreams: Auburn’s Accelerated Bachelor’s/Master’s (ABM) program in community planning. The ABM program offers Auburn students the opportunity to earn both their bachelor’s and master’s degrees in less time and at less cost than usual by allowing them to count up to 12 credit hours toward both degrees. Bachelor’s/Master’s student to go into airport design as a profession. Auburn currently offers more than 15 ABM programs with more being developed. Corona was initially hesitant about earning both degrees from the same school, but after learning more about the ABM program in community planning, he became a believer in the accelerated curriculum and the advantages it offers. He is the second student in Auburn’s College of Architecture, Design and Construction to enter the program. Part of that marketability comes from the graduate courses that Corona has already completed. Compared to his undergraduate courses, the graduate-level courses dive deeper into the issues explored in class. In one of his graduate classes, the undergraduate and graduate students learned the same material, but the graduate students completed a research paper and also collaborated on a group synthesis project. As he envisions it now, that future will include going into airport design as a profession. It’s a natural next step for a young man who grew up around airplanes and was a national officer of Silver Wings, an organization that develops civic leaders through community service and education about national defense, particularly issues related to the Air Force. Corona came to Auburn in 2012 after graduating from high school in Rome, GA. As one of only two students at Auburn from his high school, he jumped head first into many campus activities in order to meet new people and make his mark on campus. Since coming to Auburn, he became a transfer student orientation leader, helped start the Auburn Mentoring Program, and joined the Auburn University Marching Band as a trombonist – even becoming one of the drum majors for the 2015 season. “Getting involved with band was probably the best thing I’ve done at the university,” Corona says. He joined the band as a sophomore in 2013 and witnessed firsthand the Auburn football team’s unexpected run to the BCS Championship game that year, including miracle wins against Georgia and Alabama. As a drum major, he is now one of the few student leaders of the band – an opportunity he relishes. “We have to work a little harder because we have such a big-time commitment in the fall, but we get all these memories with our friends during games and even marching band practice,” he says. Corona mentors two students at Yarbrough Elementary School in Auburn. He and the other AMP leaders are already seeing the fruits of their labor. Several students they mentor have decided to pursue postsecondary education after having initially decided not to do so. AMP has also developed a branch focusing specifically on special needs students – an area near and dear to Corona, who has a special needs sister. “I thought it would be really cool to have college students that care about these special needs kids that can give them a friend that is someone other than their peer,” he says. As Corona begins to wrap up his time at Auburn, he is grateful the ABM program is allowing him to earn his master’s degree while saving time and money. However, it’s the intangibles for which he is most thankful.